The Siberian Sidekick 22 quart is the go anywhere anytime companion for all outdoor enthusiasts. Perfect for days on the beach, in the boat or packing your own lunch for work. When you are your own hero, you have to have a sidekick. The Siberian 30 quart cooler is made using high-temperature roto-molding process, resulting in an extremely tough one-piece cooler, insulated to keep ice for days. The Siberian 30 is the perfect personal cooler for any adventure. 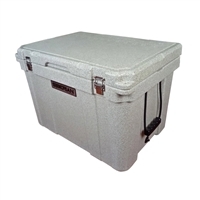 The new Siberian Outback Cooler 30 Quart is designed for maximum performance and durability. Roto-molded outshell with foam core provide superior insulation properties. Latches and hinges have been upgraded to stainless steel. Bottom feet are reversible from easy glide to non-skid. Now features lock plates and strap slots for added security. The Siberian 40 quart cooler is a perfect weekender cooler. Whether you are floating the river with the boys, or spending the weekend at the beach with the family, the Siberian 40 is the cooler for you. We make every cooler using high-temperature roto-molding process, resulting in an extremely tough one-piece cooler, insulated to keep ice for days. 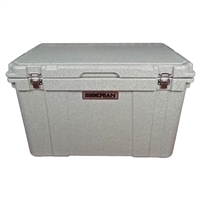 The new Siberian Outback Cooler 50 Quart is designed for maximum performance and durability. Roto-molded outshell with foam core provide superior insulation properties. Latches and hinges have been upgraded to stainless steel. Bottom feet are reversible from easy glide to non-skid. Now features lock plates and strap slots for added security. The Siberian 64 is smallest size in the Siberian Pro-Series. The Siberian Pro-Series Coolers are tough as they come. Built to last for years of rough daily abuse, this cooler is perfect for Outfitters, Charter Captains and serious Outdoorsmen who depend on the best, but don't need the biggest. The new Siberian Outback Cooler 82 Quart is designed for maximum performance and durability. Roto-molded outshell with foam core provide superior insulation properties. Latches and hinges have been upgraded to stainless steel. Generously sized to store your harvest from multiple days. Bottom feet are reversible from easy glide to non-skid. Now features lock plates and strap slots for added security. The Siberian 85 is the powerhouse of the Siberian Pro-Series, second only to the flagship Siberian 116. The Siberian Pro-Series Coolers are tough as they come. Built to last for years of rough daily abuse, this cooler is perfect for Outfitters, Charter Captains and serious Outdoorsmen who need a smaller size than the 116. The Siberian 116 is the flagship cooler of the Siberian Pro-Series. The Siberian Pro-Series Coolers are tough as they come. Built to last for years of rough daily abuse, this cooler is perfect for Outfitters, Charter Captains and serious Outdoorsmen who need the maximum volume. The new Siberian Outback Cooler 125 Quart is designed for maximum performance and durability. Roto-molded outshell with foam core provide superior insulation properties. Latches and hinges have been upgraded to stainless steel. Oversized to store your harvest from multiple days. Bottom feet are reversible from easy glide to non-skid. Now features lock plates and strap slots for added security.